So anyway, I lugged this heavy thing to the Children's Home and they loved it. The top layer was vanilla with raspberry mousse filling. The middle layer was lemon with cream cheese filling. And the bottom layer was chocolate, of course. It seems like chocolate is the way to a person's heart. The kids ate all of the fondant balls surrounding the cake because they thought they were marshmallows - I'm glad they thought they tasted okay. It's so hard to find fondant that tastes good. I hope you enjoyed this cake and have a great weekend! Pretty came and such a nice idea! It felt really good. I should do that again soon! Yes, the lemon cakes are my favorite. Yummmm. 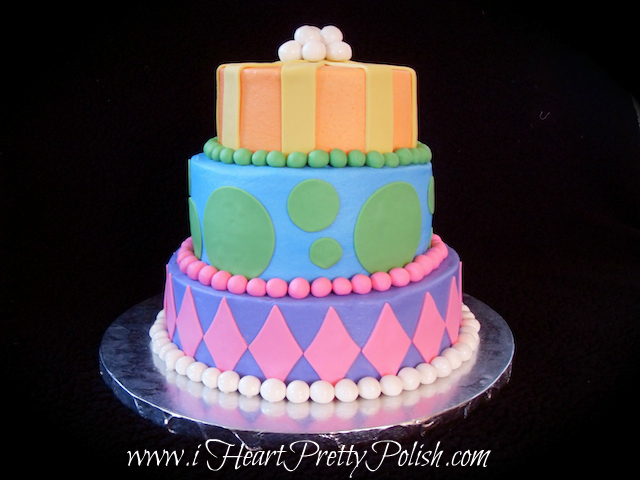 Beautiful cake - and what a beautiful heart you have! I'm sure they loved it! LOL, well you need to start making cakes then! Not only is that a beautiful cake (wow), but that's also very generous. I'd be interested in seeing recipes for the cakes and fillings. That's a great idea. I should post my recipes from now on. Will do!